On the edge of the infamous Fox Tor Mire stands an old stone cross, it’s mounted upon a three stepped pedestal. This ancient cross is said in legend to be the tomb of Childe the Hunter who was a wealthy Saxon lord who loved the thrill of the chase. The legend tells of how one winter when Childe was out hunting he became trapped on the moor by a violent storm and became utterly stranded. In order to stay alive he disembowelled his horse and crept inside its carcass in the hope of keeping warm. Sadly this was not the case and he froze to death inside his carcass shelter. The tomb although marked on many maps is not included on Donn’s 1765 map of Devon. Risdon, in his survey of Devon does tell the story of Childe the Hunter, this was published in 1650 and is probably the first mention of the tale. He also speaks of the tomb being one of the “three remarkable” things of Dartmoor. and says “…The second is Childe’s of Plimstock tomb.” The story is related by Mrs Bray in pp 213-4, who mentions the Childe’s Tomb and its inscription. The actual tomb that stands today, according to Crossing, p.89-94, was “perfect” until 1812 when it was virtually destroyed by workmen building the nearby farmhouse of Fox tor. In 1826 Carrington recorded the tomb as consisting of a pedestal formed by three steps, a socket and groove for the cross which had its shaft broken. Crossing then goes on to relate how he found the ruined grave and eventually 9 of the 12 pillars that formed the pedestal. He later discovered that three more at the one time Fox tor farm. The cross was seen in 1823 and 1825 and then it vanished. Crossing records how he found the head of a cross in 1881 in the corner of one of the old Fox tor enclosures but was unsure whether it came from Childe’s Tomb. 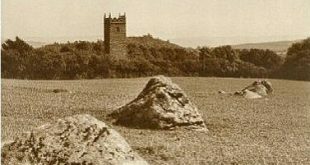 The tomb was restored in 1885 by the Dartmoor Preservation Association and as Harrison notes, p.69, a new cross and socket-stone were cut. Hemery, p.360, adds that the stone was cut in Holne. Sandles, p.28 measures the ‘new’ cross at a height of 3.37ft (1.03m) and a span of 1.67ft (51cm). Butler, pp.218-220, remarks how the tomb was a Christianised cairn. He also quotes how Crossing found the open and robbed kist in 1812. He also describes the kist as having a kerb retaining circle which once surrounded the covering cairn. Outside this re-erected kerb can be seen a circular scatter of what was probably the original cairn stones. Nobody has ever found the slab that Risdon described with the inscription on so maybe that was poetic licence. The place of Guile Bridge is generally regarded as either being the Guild Bridge or alternatively the Abbey Bridge, both in Tavistock. Bray, A. E. 1879 The Borders of Tamar & Tavy, W. Kent, London. Butler, J. 1993 Dartmoor Atlas of Antiquities Vol. IV, Devon Books, Exeter. Finberg, H. P. R. 1969 Tavistock Abbey, David & Charles, Newton Abbot. Harrison, B. 2001, Dartmoor Stone Crosses, Halsgrove Pub,. Tiverton. Hemery, E. 1983 High Dartmoor, Hale, London. Sandles, T. 1997 A Pilgrimage to Dartmoor’s Crosses, Forest Pub., Liverton.